The DEADLINE is July 26! 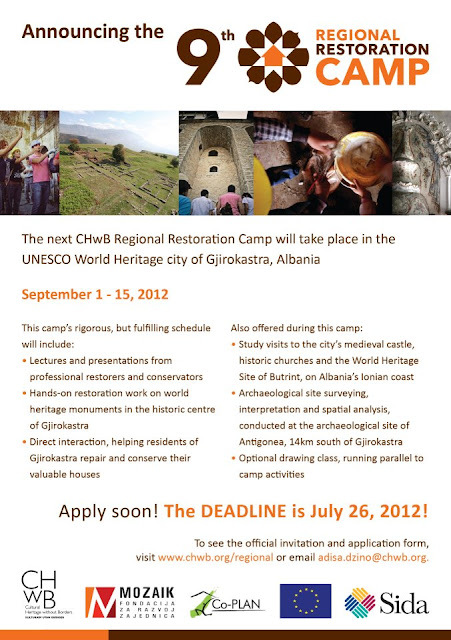 During a two week period this summer, 50 students and young professionals from around the Balkans will gather in one of the most astonishing UNESCO protected cultural sites in the region, the World Heritage City of Gjirokastra, Albania, to participate in what has become a prominent activity in this field for Southeastern Europe. The 9th Regional Restoration Camp will start on September 1 and will continue until September 15, 2012. For the 14 days of the camp, you and the other participants will follow a rigorous but very fulfilling schedule, which combines theory – through lectures and presentations – with exercises and actual restoration work on world heritage monuments in the historical center of Gjirokastra. You will be working on a Hamam, a traditional Turkish bathhouse from the 17th century and also with other inhabited monuments, directly helping the residents of Gjirokastra with the repair and conservation of their valuable houses. Through discussions raised with the monument owners, we will share knowledge about basic repair techniques, which will give owners the incentive to perform regular upkeep within their own capacities. For those of you interested in developing your artistic talents, an optional drawing class with several sessions will run parallel to the camp and its activities. For the second camp in a row, we will also offer the topic of archaeological site interpretation and spatial analysis, which will be conducted at the archaeological site of Antigonea, 14km east of Gjirokastra. In addition, you will be invited to participate in study visits to the city’s medieval castle, historic churches outside Gjirokastra and the Archeological and Natural World Heritage Site of Butrint, along Albania’s Ionian coast. • How do you analyze stone walls in order to propose the best restoration interventions for cracks and deformations?• How do you recognize and work with different types of wood?• How do all of these traditional materials interact with one another? The 9th restoration camp is going to be implemented as part of a wider regional project titled “Western Balkans - From historical integration to contemporary active participation”. This project is funded by the EU and was approved under the EU program entitled “Preparatory actions for preserving and restoring cultural heritage in conflict areas in the Western Balkans for the year 2010”. The main objective is to use cultural heritage as a platform for professionals, both men and women, to meet and create conditions for reconciliation as a prerequisite for peace and democracy with respect to human rights, as well as to stimulate local economic growth by developing cultural heritage into an income-generating activity. Download a copy of the invitation and application!If you have any questions about the application, feel free to email Adisa Dzino at adisa.dzino(at)chwb.org .